Quick post highlighting a stock trading idea near its all time high. Overall HAWK – Blackhawk Networks looks very constructive. 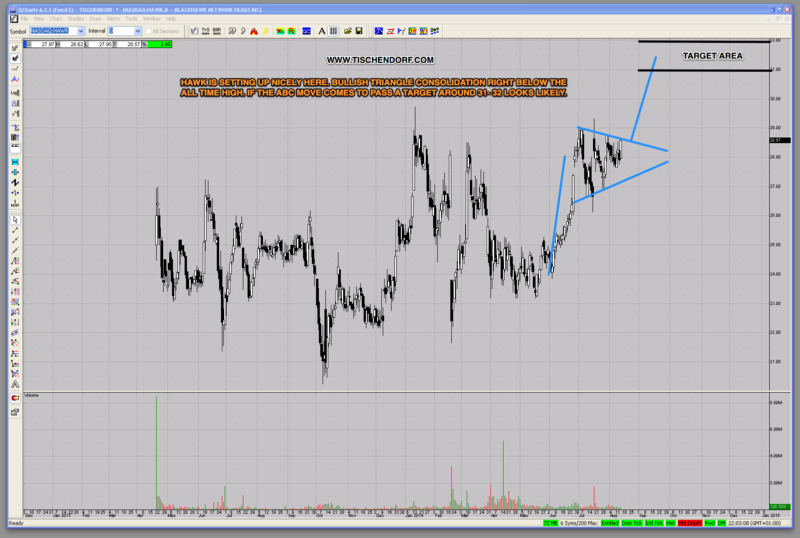 The chart displays a thrusting move and a triangle consolidation right below the all time highs. 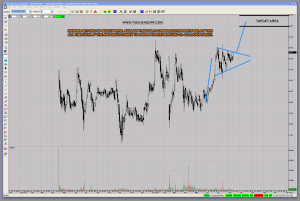 Technically speaking the trend leading into the triangle pattern should resume soon. That would give us a likely target around 31 – 32$. Earnings are due in October so a breakout into new highs would be supply demand induced. Such a situation where a stock moves due pattern pressure and supply demand imbalances is sometimes preferable. It significantly reduces being at the mercy of news induced moves. I bought an initial position. Blackhawk Network Holdings, Inc. provides various prepaid products and payment services. It distributes digital media and e-commerce, dining, electronics, entertainment, fashion, gasoline, home improvement, and travel closed loop gift cards; and single-use non-reloadable gift cards. The company also distributes prepaid handsets; and a range of prepaid wireless or cellular cards that are used to load airtime onto the prepaid handsets. In addition, it provides various prepaid financial services products, including general purpose reloadable (GPR) cards comprising Green Dot and NetSpend branded cards, as well as PayPower; and Reloadit, a GPR reload network product that allows consumers to reload funds onto their previously purchased GPR cards. Further, the company offers Cardpool, an online gift card exchange product; and digital wallet services that enable other digital wallet providers to utilize its prepaid wallet services. Additionally, it provides corporate incentives and consumer promotions solutions. Blackhawk Network Holdings, Inc. distributes its products through grocery, convenience, specialty, and online retailers in the Americas, Europe, Australia, and Asia. The company was founded in 2001 and is headquartered in Pleasanton, California. Blackhawk Network Holdings, Inc. (NasdaqGS:HAWK) operates independently of Safeway Inc. as of April 14, 2014.